Our daughter Grace had low birth weight, had trouble gaining weight and soon needed a G-tube for adequate nutrition. During her first year of life she was tested for many things, but no one could explain what was wrong with her. We were referred to Dr. Saneto, who suspected mitochondrial disease and eventually diagnosed Grace at age 4 1/2 with a muscle biopsy. Dr. Saneto and his team have been following and treating her ever since. Turning 11 is proving to be a big milestone for Grace. The little girl face and body is growing into a young lady. Her demeanor and interest in the world has also shifted. Grace is more interested in her family’s conversation, wanting to participate instead of passively listening. Though still non-verbal, at doctor visits, Grace greets the staff with smiles and interest. At school, Grace’s teacher took ownership of explaining mitochondrial disease to her class and how they can help Grace fully participate with the class. She is helping the students go beyond acceptance and working to include Grace in every aspect of school life. It can be hard when Grace misses one-third to one-half of her school days in the winter. Keeping Grace healthy enough for school gets harder every year due to her fragile immune system. A cold can knock Grace out for two-three weeks at a time. School staff, therapists and friends have been very accommodating. 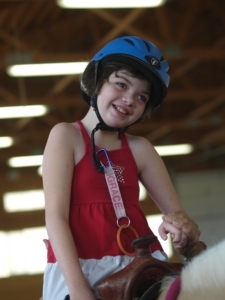 This year, Grace gets to give back as a poster child for one of her favorite places, her therapeutic riding center. The horse she rides completely loves her, and the staff and volunteers rearrange their schedules to be sure to work with her. Grace, who can only stand with assistance on the ground, can now post in the saddle, which means she can stand on her feet in the stirrups! We are so grateful for all the people who help Grace in a year: therapists, amazing school staff, horseback riding volunteers, wheelchair and equipment vendors, family members, extended family members, Seattle Children’s staff, nurses, and of course Dr. Saneto. And to Grace, thank you for being you. Because of you, we have met some incredibly intelligent and caring people who believe in your abilities and hold hope for your future, as we do.